On July 3, 1806, after crossing the Continental Divide, the Corps split into separate groups so Lewis could explore the Marias River. Lewis and Clark stayed separated until they reached the confluence of the Yellowstone and Missouri Rivers. During their separation, Captain William Clark visited Pompeys Pillar on July 25, 1806. On July 25, in Clark’s group, the nine floaters noticed a huge sandstone rock “200 feet high and 400 paces in circumference” not far from the river. Clark climbed it and saw “Emence herds of Buffalows, Elk and wolves.” Indian pictographs were on the rock, and to them he added his name and the date: Wm. Clark, July 25, 1806. He named the rock Pompy’s Tower (now called Pompeys Pillar) after Sacagawea’s baby, whom she carried on a cradleboard strapped to her back for the 14 months that she accompanied and aided the expedition. A boardwalk leads to Capt. 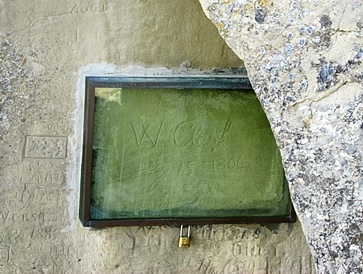 Clark’s signature and to the top of the Pillar, which is the last physical evidence of the Lewis and Clark Expedition. Trails lead visitors past a replica of Captain Clark’s canoes and to a view of the 670 mile-long Yellowstone River. The concrete Riverwalk, representing the Yellowstone River, begins in the parking lot and meanders through the interpretative center to the base of the Pillar. Signs along the path quote from Clark’s journals and tell of the party’s experiences from their entry on the Yellowstone on July 15, 1806, to their encampment at the confluence of Yellowstone and Missouri Rivers on August 3. 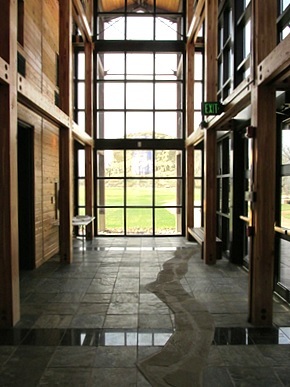 The Interpretive Center opened in 2006 to coincide with the Bicentennial of the Lewis and Clark Expedition. Exhibits in the 5,700-square foot center cover the Yellowstone River Valley journey of Captain William Clark and his detachment, including Sacagawea and her son Pomp in 1806. The center also focuses on native culture, flora and fauna, the Lewis and Clark Expedition, and the history of Pompeys Pillar. A short film is featured called “About the Expedition”. Enjoy bird watching at Pompeys Pillar. The riparian areas, dominated by Cottonwood and Willow along the Yellowstone, are great habitat for warblers, vireos, tanagers, kingbirds, and other passerines. Great Horned owls as well as Bald Eagles and Osprey all nest either on site or nearby. The prairie to the south provides great habitat for falcons, sparrows, pheasant, and a variety of other species. Enjoy the geological features of the Monument site. The Pillar and the cliffs across the river are composed of sandstones and shales. 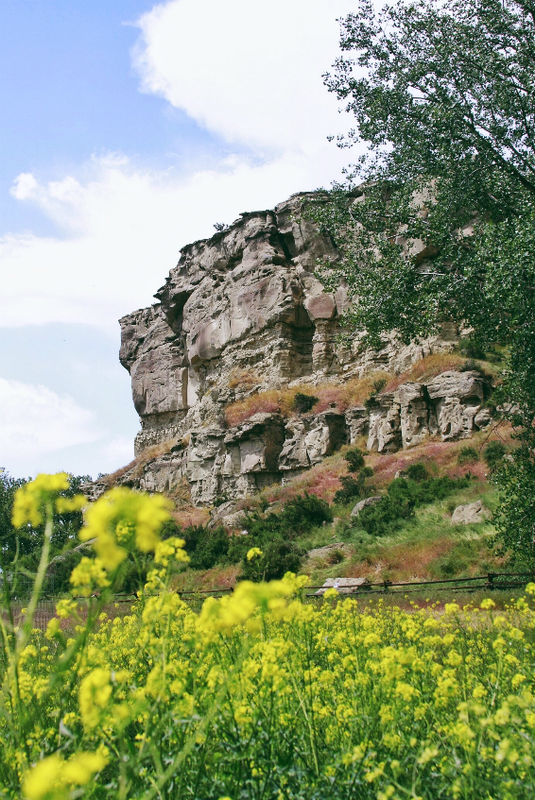 Although no animal or plant fossils have been documented at Pompeys Pillar, significant fossils have been found in similar sandstone beds nearby. Directly north of the Pillar is a viewing area of the Yellowstone River, to which both trails and sidewalks lead. The Yellowstone River meanders and is the longest free-flowing river in the lower 48 states and provides rich, fertile farmland and habitat for many wildlife and bird species. The riparian areas along the river contain several cottonwood community types. Many standing cottonwood trees within the flood plain are estimated to be more than 100 years old. Finally, for those who love a good picnic, there are tables set up throughout the monument. You are also more than welcome to place a blanket on the ground, or in one of our tipis, and have your lunch. The picnic tables are up year round, so even if the Interpretive Center is closed, folks are still more than welcome to come in and use the area.